I'm taking a little break from the #RemixFix2015 challenge to bring you this adorable plaid cape from The Mint Julep Boutique. I love love love my blanket scarves and wearing them as a shawl, but those things are for real blankets. What's great about this poncho is that it is pretty lightweight, so it will work as a great transition piece into the spring. The color combination of this plaid is perfectly versatile. It was a no brainer to pair it with this pinstripe top. I'm a little bit embarrassed to say that I haven't shopped The Mint Julep Boutique before, and I feel like I may be the last woman standing who hasn't! When they asked if I wanted to collaborate with them, I immediately fell in love with so many things on their site. 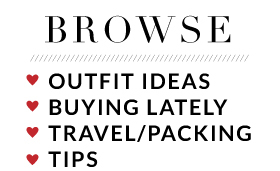 It's basically a one stop shop for all things good - from accessories to clothing to shoes. Lucky for you, The Mint Julep Boutique was nice enough to offer one of my readers a $25 gift card. Since all their products are crazy affordable, this $25 will go a long way. I hope that some of my favorites above inspire you to shop! The giveaway will run for one week and is open to US residents only. Enter using the Rafflecopter below, and GOOD LUCK! NOTE: Although The Mint Julep Boutique gifted me this cape, all views express in this post are my own. Linking up for Style to Inspire and Rachelle and Cha Cha for #HowIFall. That cape is so adorable on you! I had never shopped at The Mint Julep Boutique before they contacted me either, and I found so many things that I love on their site. I actually bought a super cute red bag from them and used it in my post today. lol! I'm hooked! That plaid cape is so fun and will fit so perfectly with your wardrobe. I love the clean styling of it here, and those cognac booties from Mint Julep are really cute. Fingers crossed that I win! The plaid cape, the boots, the bag I want it all. 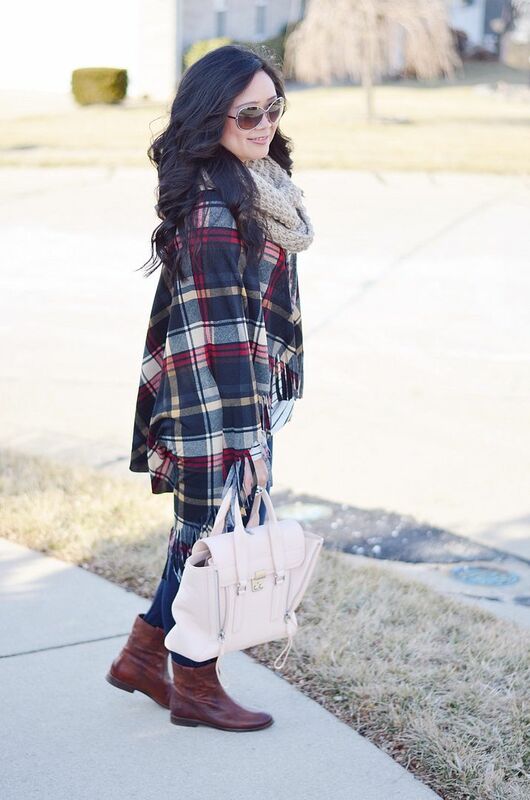 The plaid cape is EVERYTHING - a great layer piece!! 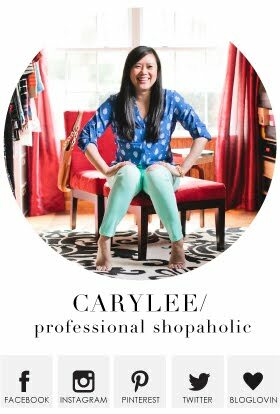 I hope you join the Shoe & Tell linkup I am co-hosting with Cherie this week! I'm loving that plaid cape! This layered look is perfection! You look gorgeous!!!! I'm in love with the plaid cape! Love the cape! Mint Julep has some great pieces. I love how you styled that cape! I love the plaid and stripes combo too! I've never shopped Mint Julep Boutique but I see it everywhere! 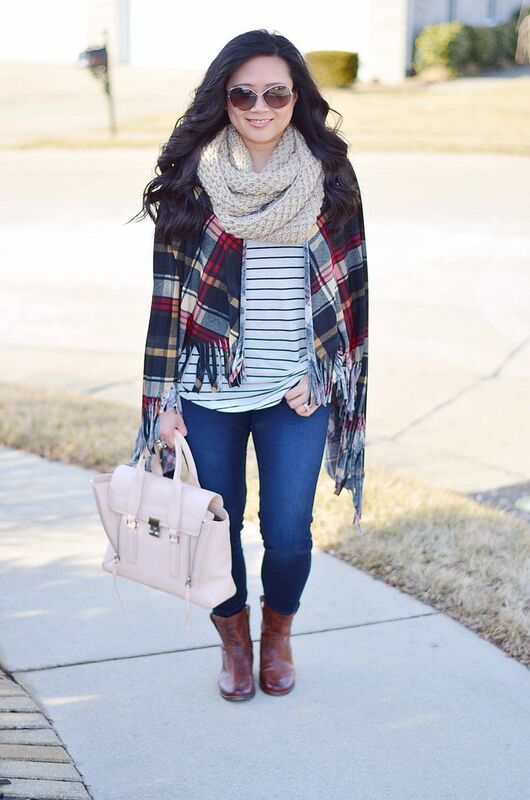 I'm loving the plaid cape + scarf combo. You look so snuggly but still super chic- as always! 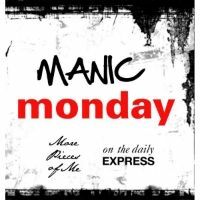 :) Happy Monday! Love this plaid! Your hair looks amazing in these pictures! I need to check out Mint Julep! I've been seeing it on a lot of blogger sites but never heard of it before! Thanks for the giveaway! This cape is so cute! I love the colours in it, and the striped shirt underneath is perfect. so cute! i would love to win this giveaway! i'm going to check out more pieces from mint julep! I do really like their stuff! I look there way too often! This cape is no exception! Cute cape! It definitely looks soft and cozy. I wish it would cool down here so I could bust out my "Winter garb". You look fantastic! Mint Julep has great stuff!! Love the way you wore this scarf, it looks so great as a shall! I am giving away a gift card to Mint Julep too! Aren't they a fun store? Great giveaway and I love the scarf/cape! Oooh. 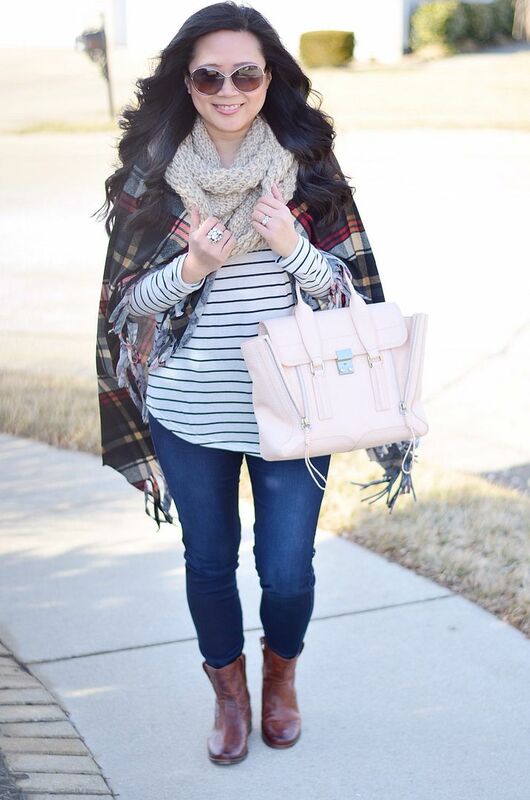 I really like that cape and love it with the stripes and knit scarf. I can't wait to see how you style it for spring.